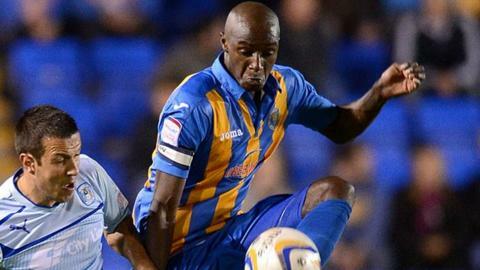 Shrewsbury Town striker Marvin Morgan is hopeful that someone is called to account for the racist abuse he and team-mate Jermaine Grandison suffered in Saturday's 2-2 draw at Hartlepool. The Football Association has begun an investigation after two separate incidents were included in referee Carl Boyeson's match report. "Hopefully they can find the person," Morgan told BBC Radio Shropshire. "I'm not allowed to say certain things. But I've been told it's looking good." Apart from the FA's investigation, Morgan has also received backing from the police, the 'Let's Kick Racism Out of Football' campaign and the Professional Footballers' Association. "With CCTV cameras and people coming forward, it will all help," added Morgan. "I think there will be some updates in the next couple of days. "I've not been racially abused since I was a kid and never as a professional. "It was quite upsetting but you have to make people aware that it is still going on. "And it's good that we've got a lot of support. The police, the FA, the PFA and Let's Kick Racism Out of Football are all involved. "The sickening thing is that when it was said there were kids all around. That's why I never really reacted. I reacted in a calm manner. But it's sad that people think it's still acceptable to say things like that." Morgan insists that he and Grandison, both signed by Town boss Graham Turner in the summer of 2011, are now concentrating only on Saturday's home game with Swindon. "I nearly scored a hat-trick on Saturday," added Morgan, who scored both Town's goals at Victoria Park, to take his tally to four for the season. "In fact, I should have done and that would have shut them up."